The House of Love and Prayer is a synagogue where the melodies of Rabbi Carlebach fill one’s soul with joy and sweetness. Named after the popular Carlebach center in San Francisco, Tzfat's House of Love and Prayer shares the goal of giving everyone the feeling of home--even if one lives at the other end of the world. Established by students of Rabbi Shlomo Carlebach, this shul offers Carlebach’s renewed approach to one’s relationship with G-d and Judaism and focuses on building an appreciation of life and deepening bonds with our loved ones. The House of Love and Prayer is also a cultural and spiritual center with lectures, workshops, evening concerts and activities for all ages. 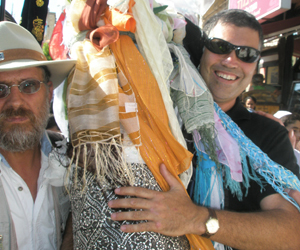 In the summer, during Tzfat’s famous Klezmer festival, they hold a lively Carlebach festival. Rabbi Carlebach taught that the greatest thing in this world is to do something good for someone else. As a result, the House of Love and Prayer does acts of charity in the community. The center is actively involved in rehabilitation programs for youth at risk and offers subsidized afternoon homework help for children from troubled families. The center also offers afternoon courses in guitar, violin, science and art for children who can’t pay for regular courses. They also visit ill, elderly and lonely people in Safed. At The House of Love and Prayer, one can experience spiritual elevation like never before. The Kabbalat Shabbat services are filled with heartfelt singing, dancing, clapping and focused prayer to the tunes of Carlebach. Saturday prayers are very meaningful and the seudah shlishit offers touching words and insight based on the stories of Carlebach. Havdalah rocks as guitars, flutes and drums say farewell to a most fulfilling Shabbat. The synagogue makes all special occasions meaningful, creating incredible ruach for bar and bat mitzvas, brit milas and baby naming ceremonies. To learn know more and find out about upcoming events, check out The House of Love and Prayer.